Bagnalls ‘painting the town’ after national triumph as Supreme Champions at the Family Business of the Year Awards 2016. Family Business United is delighted to announce that Bagnalls, the nationwide painting and decorating business from Shipley in Yorkshire have taken the top prize at the prestigious Family Business of the Year Awards 2016. “ They represent a truly great British family firm and truly deserve all the plaudits that winning this award brings. Not only did they win the overall title, but were crowned Yorkshire Family Business of the Year 2016 too." Previous winners of the award include Potter Logistics, WTA Group and JW Lees Brewery so Bagnalls are following in the footsteps of some incredible family firms. 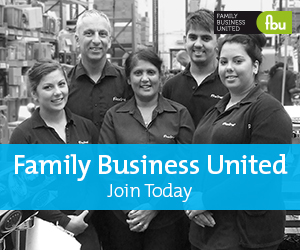 The Family Business of the Year Awards are organised by FBU, the award-winning magazine and resource centre that champions and celebrates the family business sector. Now in their fourth year, these awards recognise the diversity, strength and depth of family firms across the UK and seek to highlight the contribution that family firms make to the UK economy. *The People’s Choice Awards were voted for by the public online to determine the regional and overall winners whereas the other winners were determined by the judging panel.